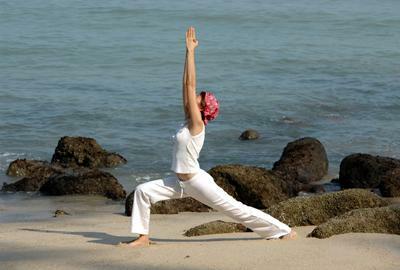 The warrior pose, or virabhadrasana, is a posture that represents the spiritual strength of a yogi. The root of virabhadrasana, virabhadra, represents the warrior of historic yogic texts, derived from the ancient god Shiva. Open and stretch the chest, lungs, shoulders, and neck. Tone the power core of the body. Step your legs apart to the side 3-1/2-to-4 feet. Keep your back straight, tailbone down, pelvis lifted, but not tilted forward. Turn your right foot 90 degrees out, and your left foot approximately 45 degrees inward. The arch of the left foot should be aligned with the heel of the right foot. On an exhale, slowly move your torso over your right leg. Keep the left leg strong as you move the right leg into a 90-degree angle, knee over the ankle. If you don't have high blood pressure or shoulder problems, raise the arms overhead, shoulders down, palms facing each other but shoulders-width apart. Hold this pose for 30-seconds or so. To release, activate the left leg, inhale, then straighten the right leg, center the torso, and bring the arms down. Breathe through two cycles, and repeat on the left side. For more instructions on warrior pose, visit Yoga Journal. Focus on breath and form. Understand what it feels like to have both legs "activated" without tightening the knee joints. Keep your back straight and tall as to not put strain on the lower back.Some yogis new to warrior pose actually find Warrior II an easier pose to start with, then move on to practice Warrior I. Work on holding all three warrior poses for a longer duration.